OTTAWA, ONTARIO, September 23, 2014 – Today, Skills/Compétences Canada released four dynamic campaign videos created by the participants of the 2014 National Youth Forum (NYF). 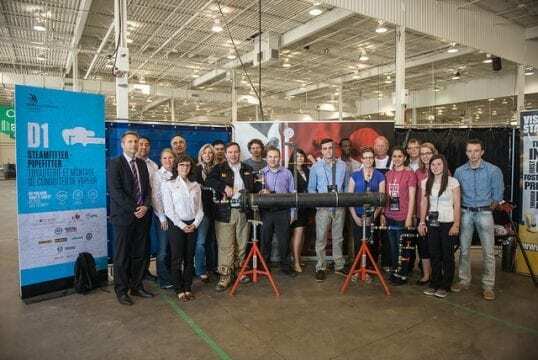 Sponsored by Shell Canada, the 2014 NYF took place within the context of the Skills Canada National Competition earlier in the summer. Led by a seasoned Skills Canada marketing facilitator, twelve young participants from across Canada worked in four teams to deliver social media marketing campaigns for Shell Canada. Over two days, participants were tasked with developing campaigns that would identify creative ways the oil and gas industry could harness social media to reach out to, recruit and raise awareness in skilled youth about employment opportunities. The campaigns focused on skilled trades specific to the oil and gas including sector, including: electricians, welders, pipefitters, power engineers, instrumentation technicians, heavy and light duty mechanics, heavy equipment operators, millwrights, field operators and process and control room operators. As a result, participants learned how to formally conceive a marketing plan and how to implement a social media campaign, as well as practicing all of the nine Essential Skills. “Being part of the National Youth Forum was such an amazing experience. Just like participating in the Skills Canada competitions, the work we did at the NYF was akin to corporate projects being done in the real world. You can’t get more hands on that this,” said Jean-Philippe Desbiens, WorldSkills Leipzig 2013 competitor in IT Network Systems Administration. On the final day, participants were asked to present their campaigns, including videos, to a panel of Shell Canada judges. The session proved to be a learning experience for Shell too, as the young marketing experts provided feedback to the organization about more effective ways to reach youth and the importance of promoting an engaging and interesting brand by leveraging all of the social media platforms for different purposes. “Shell’s sponsorship and participation in the National Youth Forum gave great insight on how we as industry can better target our youth to get into the trades,” said Cathy Sweet, Military Recruitment for Shell Canada. According to Shell representatives on hand, the degree of professionalism and the quality of the feedback that was provided by these keen young people was remarkable, especially given their short two day time period to produce such a sophisticated campaign. “We were truly impressed. From a marketing standpoint, it’s a reminder of the importance of consulting with your target group in order to be effective at reaching them-in a way that goes way beyond organizing focus groups,” said Sweet.